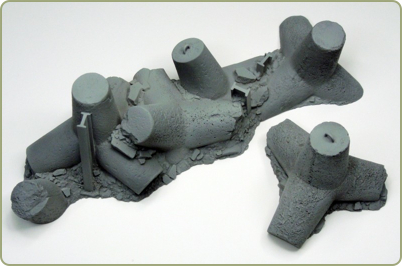 Tabletop Game Terrain has released the new TGT: City of Ruins sets. These sets are designed to be as aesthetically pleasing as they are playable. Each building comes with a base that is either 6.25”x6.25”, 11.5”x6” and 12”x12” depending on the size of the kit. All pieces are modular allowing almost limitless combinations with the other pieces in the collection. 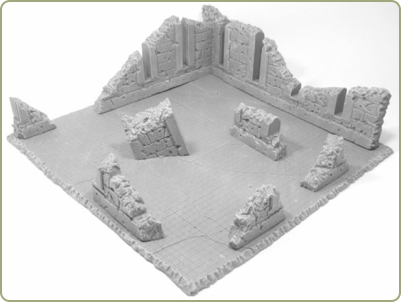 Our entire collection of buildings amounts to almost 3.5 sq ft of terrain and can be purchased together in the City of Ruins Battle Board set! This is the premiere line from TGT with an expected release of the TGT: City of Ruins road set and expansion set on April 15th and then the release of another range in March! All TGT sets are designed and priced with gamers in mind. Simply put, we wanted to begin producing lines that are VERY affordable, playable, and awesome looking on the table. With TGT, gamers won’t have to buy expensive building after expensive building to make a great game board. Make sure to check out the gallery on our website to see the terrain in action. RHQ-TV have just broadcast episode 20 where we take a look at the new Mantic Games Abyssal Dwarfs. We also get a look at their Orcs which will be released next along with their Dwarf King's Hold board game. This is a fantastic episode with lots of great fantasy stuff. This will be a story driven campaign that will go on (Bi-Monthly) all year at the Bobby Jones store. (11AM-Until) The entry fee for each game will be $7.00 and all proceeds will go to "Siege of Augusta". The winning side of each game will have an engraved plaque that shall be displayed in the store all year. Game #2: After a bloody battle the forces of Chaos and Orks pushed through the outer defenses of the hive city and the invasion is well underway. With the momentum of their first victory the forces of evil will gain an extra "Strategic Asset" in game two. The Space Marines and Imperial Guard have fallen back deeper into the city to try and gain a foothold. All the while the Tech-Priest have found that the Black Stone Fortress is starting to activate and showing signs of life. Can the forces of man win the day or will this world fall? The latest Privateer Insider blog post has details of some of the content in the upcoming No Quarter Magazine Anniversary Issue. Mongoose Publishing have a new blog post looking for fan feedback into the production of limited edition miniatures. 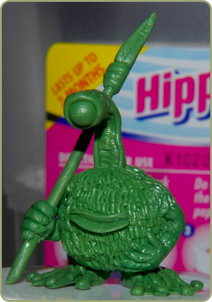 WizKids have posted some details of the changes coming in the new HeroClix rulebook. A new list of figures have been marked as out-of-print by Games Workshop. This may actually mean that they are being removed to Direct Only status. 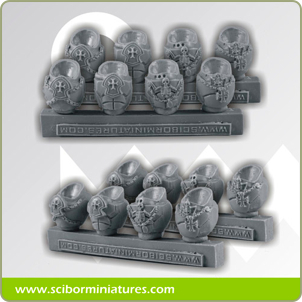 Scibor's Monstrous Miniatures have released a set of 28mm sci-fi Templar Knight torsos. Each set contains 8 torsos fit to most of the 28mm/32mm miniatures. Cast in resin. 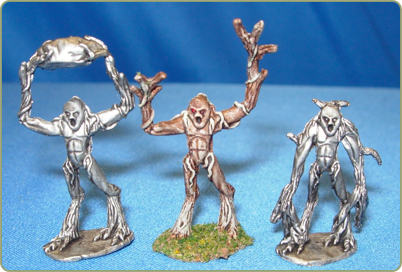 Troll Forged Miniatures have released a set of 28mm Elf figures. Vasiliev Mikhail Elves are now available from our store. Cast in resin. This is the first in what I hope to be a complete line to support the in development skirmish ruleset "Dawn - Rise of the Occulites"
Details of the Vul-Con Arena I Dust Tactics Tournament on April 2nd at Gamers' Inn in Mesa, AZ are now available. This will be an Operation First Strike Tournament that will be run Swiss Tournament Style with tie breaks based on strength of schedule, points, and if necessary, achievements. Each player will receive an Achievement Book to keep track of their achievements during the tournament. The first six players to sign up for the tournament will receive a Dust Tactics fabric patch sporting the symbol of the Allied faction. The first, second, and third place players will receive Vul-Con medals. The top Allied and top Axis players will receive a cloisonne pin with the symbol of their faction and a premium figure (with card). This special cloisonne pin acts as an invitation to participate in special pin-wearer-only tournaments at the Fantasy Flight Event Center in Roseville, Minnesota. This is going to be a very cool event, with some amazing prizes. Seats are limited, so preregister now. Editor-in-Chief, Enrico Nardini dares to explore the Mansions of Madness. Will he survive with his sanity intact? 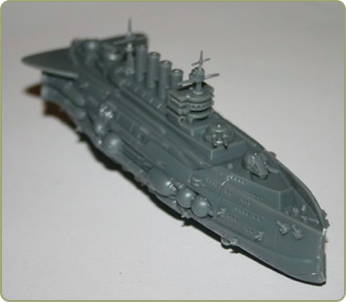 Catalyst Game Labs have posted photos of assembled test casts of one of the miniatures for their Leviathans VSF air combat game. This Special is for 50 Zombies for $50! Thats $1 for each zombie!!! This Special will be for a very very short time, so hurry. Find the Special in the Victory store. The Details This special consists of 50 randomly picked zombie figures selected from the same figure types as those found in the Zombie Horde Set#033002. ( none of the figures are selected from any of the zombies starting with the numbers 3330..) At this time there are 75 different figures ( 44 original and 31 conversions) in the pool the random figures are picked from. You allow us to pick what you receive, you save money, thats the deal. Figures are of basic design. This pack is sold at a special price and is not included in any Sales, Specials or Coupon Codes. Pack will contain repeats. New troops to bring to the fight, including six new warcasters and the debut of the mighty battle engines. New narrative fiction, including compelling stories for each WARMACHINE faction. New Theme Force lists for each new warcaster, which allow you to create armies based on specialized forces found in the WARMACHINE world. Harness the Power of Wrath and Let None Stand Against You! Available in softcover (PIP 1045) and hardcover (PIP 1046). Dust Studio Team is proud to announce that we just started our scenery range. The two first items are Tank Traps and Impassable Terrain. Both of these are in the high quality resin you already know if you're familiar with our products. These can be used to play Dust Tactics of course, or any other WW2 or Sci-Fi game. This is just the starting point of a brand new range that will soon expand. We hope you like them. 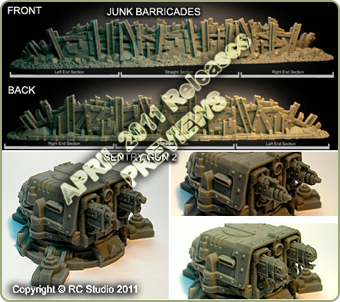 Junk Barricades Highly detailed junk section barricades : Straight section 99 mm - Left/Right sections 92 mm each. Depth 30 mm. Average height 32 mm. Sentry Gunner 2 Automated Twin Gunned Sentry Rifle - Laser - Flamer are the new Sentry Gun options soon available to buy. Release date set for the 1st of April 2011. Pricing will be made public on day of release. Also we have a note to make: April Shipping Delays - Due to unforeseen events all orders placed after the 7th April 2011 will start shipping from May 2011. Apologies for any inconveniences this may cause. Thank you. Start the party early with this stylish Super Dungeon Explore t-shirt, featuring vintage arcade art of the classic Super Dungeon Explore heroes. Our new Super Dungeon Explore shirts were such a big hit at PAX we're giving you all the chance to get your own. Shirts will be available to pre-order until April 30th. After the April 30 deadline we will run a batch to order and mail them all out. Check out SodaPopMiniatures.com for more details and to order yours. The new majority shareholder of Wargames Factory has sent a letter responding to public comments made about his acquisition of the company. Public Statement from Wai Kee Hui regarding Wargames Factory It has been a little more than 2 months since Tony Reidy posted his “Open Letter to Wai Kee Hui” on The Miniatures Page website. I was aware of this “letter” at the time of posting and although I was annoyed at his unprofessional tone and angered at what amounted to many outright lies, I decided that my best course of action was to stay out of online politics and instead focus on trying to get the company I had recently become majority shareholder of into functional order. The past 2 months have been extremely busy with trying to figure out what orders had been placed and paid for before I took over, inventorying product that was still in stock at Triangle and setting up a new order platform and shipping facility. These goals have now been accomplished, with all outstanding orders shipped and our web store reopened. Throughout this process I was cognizant of the defamation of character my associates and I were receiving in Cyberspace at the hands of Tony Reidy and Howard Whitehouse. Even though at many times the temptation was strong for me to jump in and tell my side of the story, I refrained from doing so while we were struggling to put Wargames Factory back on track. Now that we are on the road to recovery, and in lieu of increasingly slanderous postings being made by Tony and Howard, I feel the time has come for me to set the record straight. 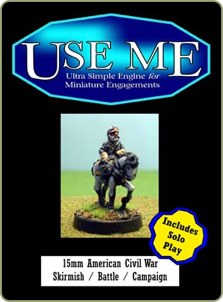 Now released by 15mm.co.uk is a brand new rules system booklet in the USE ME series: UM005 USE ME American Civil War (15mm) USE ME means 'Ultra Simple Engine for Miniature Engagements' and this system delivers just that. From skirmish to full battles, games last from five minutes to an hour. 1D6 system which can play with single based miniatures or element based miniatures so you can use your existing collection. Play in your lunch break or in the evening when the idea of a really complex system with a long set up time really does not appeal. Pick up any of your miniatures and get playing in minutes. Solo rules also included for when you want a quick game on your own. This complete rules system is printed in A6 format which is a booklet which will fit in your pocket (110mm by 180mm) making it truly portable as well as fantastic value for your money. USE ME is just that...its for you. 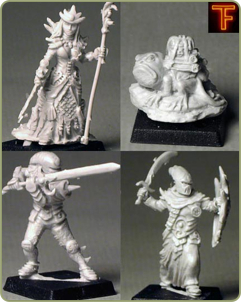 Lots of new 15mm packs in the Splintered Light Miniatures line. Cave Imps: Sculpted by Wiff Waff. These will make great opponents for the gnomes.